It’s Ricky Ricotta’s birthday, and as a special treat, his parents are taking him and his Mighty Robot to see the dinosaurs at the museum. It’s too bad they’ve also invited Ricky’s little cousin Lucy – she’s a real pest! 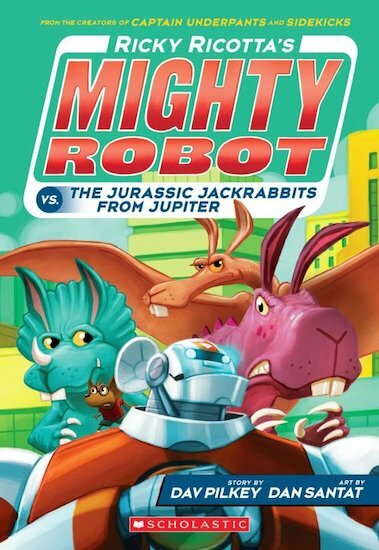 But when they get to the museum, all the dinosaurs are missing their heads… because an evil space-bunny from Jupiter has used their dino DNA to create freaky Jurassic Jackrabbits! Now it’s up to the entire Ricotta family, including Lucy, to stop them from taking over the planet!